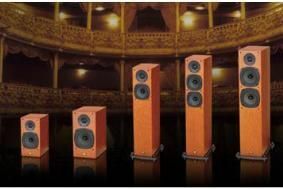 BRISTOL SHOW 2010: Castle confirms prices of new Knight speaker range | What Hi-Fi? Castle has today confirmed UK prices for its new Knight range of speakers. We'll be bringing you a review of the Castle Knights as soon as we get hold of a pair. Castle speakers will be returning to the UK at this year's Bristol Show, after an absence of several years. Now owned by IAG Group, maker of brands including Quad, Mission, Wharfedale and Audiolab, the brand had a loyal following in the UK for many years. We first brought news of the brand's return in January (see original News story), and now it's been confirmed that the new Knight series will make its public debut at the show. Castle claims the new speakers are manufactured to "furniture-grade standards with the finest materials and woods". Their real-wood veneers are sourced from sustainable timbers. The Knight range is said to offer Castle's "famously rich and smooth performance but, for the first time, a new standard in build quality and value". You'll be able to see and hear the Castle Knights in the Brussels room at the Marriott Hotel, Bristol over the weekend of February 26th-28th. For full details on the Bristol Show, see our special blog.